In response to a Lufthansa specification of 1933 for a six-passenger mailplane, Dornier designed a shoulder-wing all-metal monoplane to be powered by two 660 hp BMW VI engines. Three prototypes of this Dornier Do 17 were built in 1934, but although the airline carried out an evaluation programme early in the following year, the aircraft’s slim fuselage provided such limited passenger accommodation that all three were returned to the manufacturer. The design had military potential, however, and the fourth prototype, Do 17 V4, with twin vertical tail surfaces and a shortened fuselage was flown in the summer of 1935. Among development prototypes, the fifth was powered by 860 hp Hispano Suiza 12Y engines, the seventh mounted a 7.92 mm MG 15 machine gun in a dorsal blister, and the tenth was fitted with 750 hp BMW VI engines. The initial production versions were the Do 17E-1 which, developed from the ninth prototype, had a glazed and shortened nose, and carried a 500 kg bombload, and the Do 17F-1 reconnaissance aircraft with increased fuel capacity and two cameras. Both of these models made their operational debut with the Legion Condor in Spain during 1937. Their performance was such that they had little difficulty in avoiding contact with the obsolescent aircraft then serving with the Republican Air Force. Introduced publicly at the 1937 International Military Aircraft Competition held at Dubendorf, near Zurich, the Do 17M V1 prototype powered by two 1000 hp Daimler-Benz DB 600A engines soon gained the nickname “Flying Pencil” because of its slender fuselage. More significantly, it was able to better the performance of international fighters taking part in the contest. Following this demonstration at Dubendorf, Yugoslavia showed interest in the type and the Do 17K was developed for that nation, being similar to the Do 17M but powered by two 980 hp Gnome-Rhône 14N 01/02 engines. The type was to be licence-built by Drazavna Fabrika Aviona at Kraljevo, the three versions produced being the Do 17Kb-1 bomber, and the Do 17Ka-2 and Do 17Ka-3 reconnaissance aircraft with secondary bombing and attack capability respectively. Two prototypes of a proposed pathfinder version which did not enter production were built under the designation Do 17L, these being powered by two 900 hp Bramo 323A-1 radial engines because of a shortage of Daimler-Benz DB 600s. The same Bramo powerplant was used for the thirteenth and fourteenth prototypes to develop the airframe/engine combination for the production Do 17M-1, which could carry a 1000 kg bombload and was armed with three 7.92 mm MG machine guns. A photo-reconnaissance version of the Do 17M entered production under the designation Do 17P, powered by two 875 hp BMW 132N radial engines and carried Rb 20/30 and Rb 50/30, or Rb 20/8 and Rb 50/8 cameras in the Do 17P-1 production series. Two aircraft were built as engine test-beds under the designation Do 17R, one with 950 hp Daimler-Benz DB 600G, and the other with 1000 hp Daimler-Benz DB 601A. They were followed by three DB 600G powered high-speed reconnaissance aircraft which had the designation Do 17S-0. Used for test purposes, these had an extensively glazed nose and the airframe incorporated a bulged section in the underside of the forward fuselage, accommodating a gunner in a prone position to operate an aft-firing MG 15 machine-gun. These experimental reconnaissance machines were followed by a small production batch of 15 pathfinders, comprising three Do 17U-0 and 12 Do 17U-1 aircraft, the five-men crews of which included two radio operators to handle the new and comprehensive communications and navigation radios. Export versions of the Do 17Z were planned under the general designation Do 215, the first to be developed being the Do 215A-1, with 1075-hp Daimler-Benz DB 601A engines, which was ordered by Sweden in 1939. 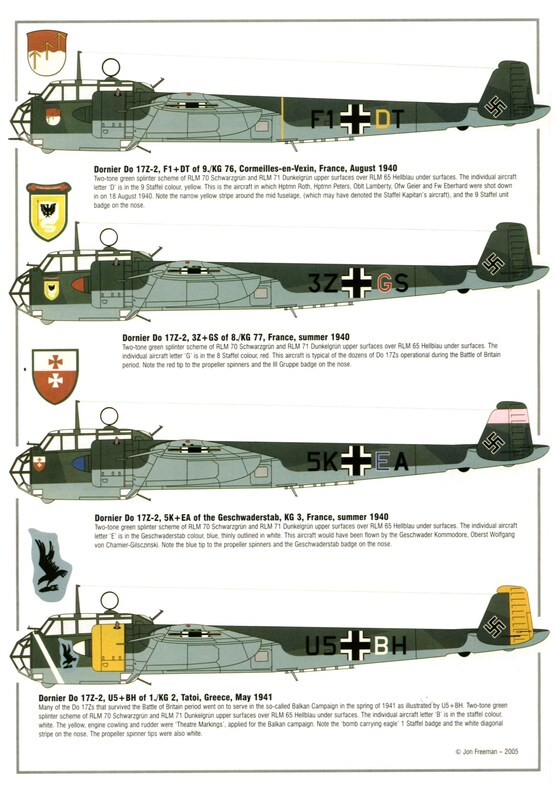 With the outbreak of WW II, the 18 aircraft were embargoed and following conversion to Luftwaffe requirements were delivered for use as four-seat bomber/reconnaissance aircraft under the designations Do 215B-0 and Do 215B-1. Two examples of the Do 215B-3 were delivered to the USSR during 1940, and the Do 215BA was a reconnaissance version, similar in configuration to the Do 215B-1, but carrying Rb 20/30 and Rb 50/30 cameras. Final variant was the night-fighter/intruder Do 215B-5 which had an unglazed nose, similar to that of the Do 17Z-10, but housing two 20-mm MG FF cannon and four 7.92 mm MG machine-guns. The Dornier Do 17 was the least numerous of the Luftwaffe bombers deployed against Britain during the Battle, but has been claimed by some to have been the most effective. Most German military aircraft of the period were designed from the start as warplanes, but were first revealed in a civil guise – masquerading as airliners or ‘high speed mailplanes’. For example, Dornier itself had built Do 11Cs in Switzerland as ‘freight transports’. The Do 17, by contrast, was really designed as a high speed mailplane, with tiny cramped cabins fore and aft of the wing accommodating six passengers with very difficult access. This was realised too late, and the three prototypes were soon placed in storage, where they remained until discovered by a curious RLM test pilot, who flight-tested one and was so impressed by its performance that he suggested the type’s conversion for use as a high-speed bomber. Dornier were by then working on the long-range Do 19, a four-engined heavy bomber, and were not greatly interested in the idea. Nor, until the death of General Walther Wever, was the Luftwaffe. But Wever’s successor as Chief of Staff, Albert Kesselring was a tactical man, through and through, and preferred large fleets of relatively cheap, lightweight bombers optimised for what was, in essence, a close support role. The Do 17 soon won his approval, while the Do 19 (probably the aircraft the Luftwaffe really needed for the Battle of Britain) was unceremoniously scrapped. Three further Do 17 prototypes were built with twin endplate fins in place of the original aircraft’s single fin, and the forward fuselage was deepened and fitted with extensive glazing to accommodate a full bomber crew. The aircraft retained much of the appearance of the original, and this led to the type’s ‘Flying Pencil’ nickname. The original Do 17E-1 bomber was easily capable of 240 mph (a stripped aircraft had demonstrated 283 mph) and great emphasis was placed on this ‘high speed’ capability. In fact, this was not even as fast as Britain’s modest Bristol Blenheim. To its credit, the Dornier could at least carry a meaningful internal bombload (by the standards of the day), and its crew of three were clustered close together, where they could work together and communicate easily. The Do 17 entered service in 1937, undergoing trials in Spain with the Condor Legion. The Do 17F-1 was a reconnaissance aircraft equipped with two floor-mounted Rb50/18 or Rb50/30 cameras. The Do 17E and Do 17F gave way to the broadly similar Do 17M and Do 17P, which were bomber and reconnaissance variants respectively, differing from the earlier versions in being powered by 900 hp Bramo Fafnir 323A or BMW 132N radial engines in place of the inline DB600s originally fitted. These raised the maximum speed to fractionally above 300 mph. The DB600-powered versions remained in limited use at the beginning of the war, but by the Battle of France all had vanished from frontline service. On 10 May, 188 serviceable Do 17Ms and Do 17Ps were available, together with 338 examples of the further improved Do 17Z. Production Do 17Zs featured more powerful (1,000 hp) Bramo 232P radial engines with two-stage superchargers, but more obviously had an entirely redesigned forward fuselage, much deeper, more extensively glazed, and with a huge underslung ventral gondola. This had first appeared on the Do 17Z (built in pre-production form only) and made the aircraft look much more like a Ju 88. It raised the crew complement to five, though the bombload remained a paltry 2200lb. Defensive armament was increased to six 7.9-mm machine guns, one fixed and one free-mounted firing forward, one firing aft in each of the dorsal and ventral positions, and two in the side windows. But these weapons were mounted singly, and had relatively limited arcs of fire. By comparison with the multi-gun powered turrets fitted to aircraft like the Wellington and Blenheim they represented little more than a last-ditch defence, although Do 17 gunners did down surprising numbers of RAF fighters which pressed their attacks too closely, or failed to break away aggressively enough. The Do 17U was basically a hybrid combining the new nose with the engines of the Do 17M. 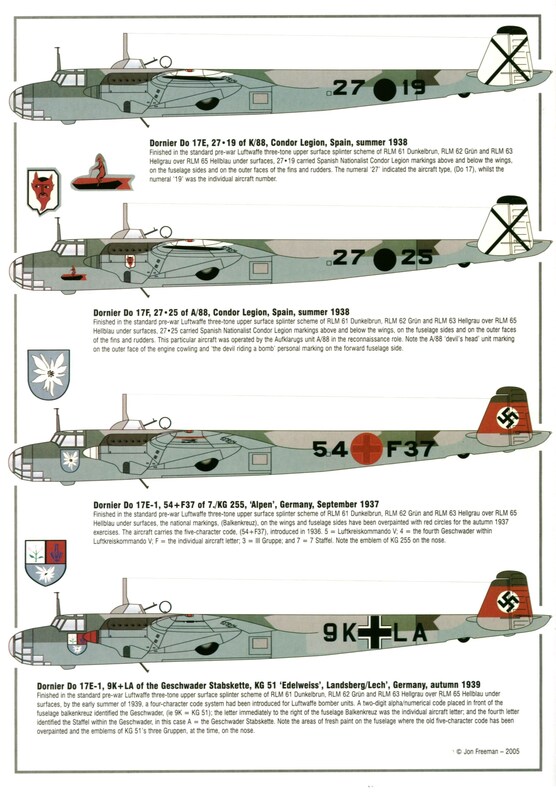 The 15 aircraft built were used as dedicated pathfinders by Kampfgrüppe 100, and carried a second radio operator. In Poland, the 17’s where all but un-stopable, their speed still gave them a defensive edge, and carrying 20 of the 50kg bombs was more then enough to decimate the fairly primitive Polish army. During the Battle of France and the Blitzkrieg, they still proved hard to shoot down, being surprisingly resilient to the 7.9mm machine guns used in most fighters. It was still a nimble airplane for its size, and could give any attacker a difficult time. The tables turned in the Battle of Britain, for all the bombers, not just the 17. The RAF had succeeded in rapidly modernizing their forces with fast, heavily armed fighters in large numbers with radar guidance. It has been said the 17’s suffered more, but a look at casualty statistics will show all the Luftwaffe bombers suffered equally heavily. What RAF pilots do acknowledged is 17’s where hard to shoot down, and many 17’s returned to safety with dozens, even hundreds, of holes in them. Production of the 17/215’s stopped in the early summer of 1940 to make way for the entirely new Do-217 (arguably a massively improved 17/215). This, and not the Ju-88, may have been the reason for cessation of production. Do-217’s first combat sortie was late in 1940 and had a successful career (in contrast, planed replacements for the He-111 and Ju-88 were slow to materialized). With no new aircraft and parts rapidly dwindling, it would not be long before they were to few to use in the Gruppen. However the 17/215’s were never decommissioned from the Luftwaffe, being in constant service use till wars end. 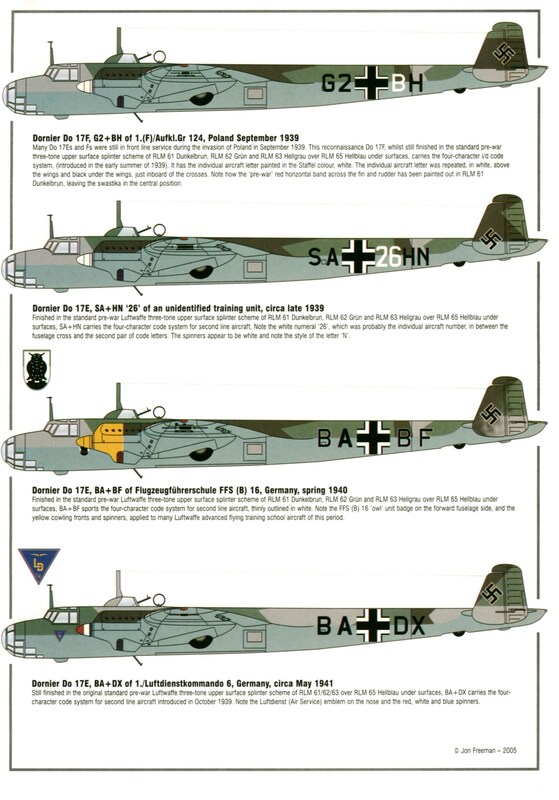 Aircraft losses suffered during the invasion of the Low Countries and France were not fully restored, while some units were already converting to the newer, faster and more effective Ju 88. Do 17 numbers dropped throughout the Battle of Britain. On 1 September 1940, the frontline bomber Kampfgrüppen had 158 Do 17Ms and 212 Do 17Zs on charge. These won a reputation for low level pinpoint bombing attacks, but also flew their share of medium level area attacks. The Do 17 was highly maneuverable, and its crews could dive at speeds which bordered on the unbelievable. If sufficient height were available, and the defending fighters low on fuel, Dorniers could sometimes escape by pushing their noses down and diving for home ‘flat out’ – much like the Ju 88. A final version of the ‘Flying Pencil’ in use during the Battle of Britain was the Do 215B, 18 of which were designed and built for export (to Sweden) but were then embargoed and re-directed to the Luftwaffe, which used them for reconnaissance duties. The Do-17 proved to be very successful and useful in the opening rounds in Operation Barbarossa, the invasion of Russia. Carrying a variety of bombs, they decimated the Russian air force caught on the airfields and tore up ground units. 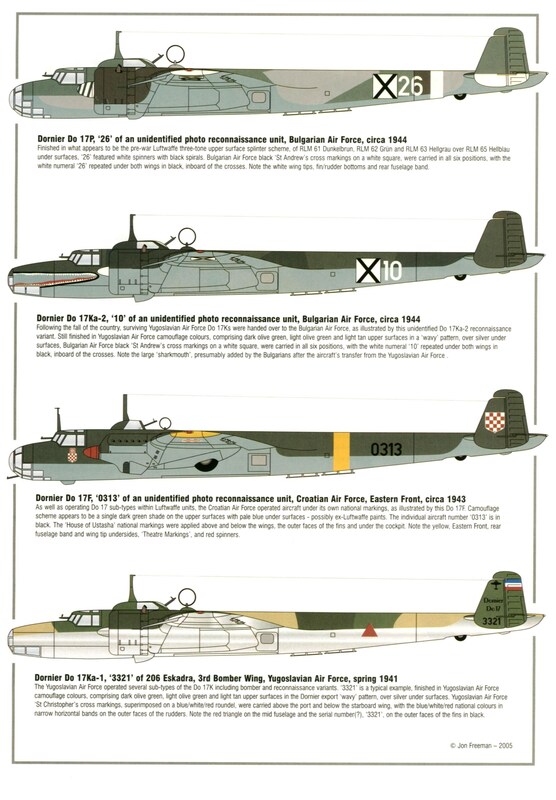 Only in the summer of 1941 when more Ju-88’s and the totally new Dornier 217 entering service, were surviving Dornier 17Z’s used in secondary missions or passed on the allied countries, like the Finns, Croats, and Rumanians. 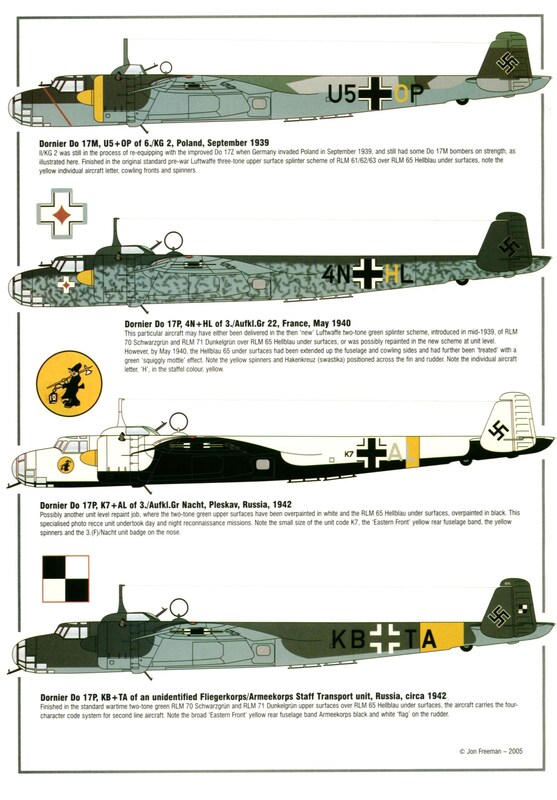 However the Luftwaffe did continue to use Do-17E’s, Do-17P’s, a few Do-17Z’s, and Do-215’s till wars end for occasional combat sorties such as combat glider towing, combat supply drops, and support duties of photo recon, training, and test beds. While 1943 seems to be the last year any groups of 17’s or 215 operated together in large formations, there is strong evidence to suggest remaining types continued to serve till wars end. KG 3, III. Gruppe was the last KG to have a full Gruppen of Do-17’s, in early 1942! After that, Do-17’s where used for various other duties, including training, and a large number equipped the Croats, an ally of the Germans. The Finnish also received 15 from the Luftwaffe (donated) which participated in the summer battles of 1944 versus Soviet Union. Do-17’s flew many of bombing missions alongside the rest of the FiAF bomber “fleet” (including Blenhiems and Ju-88’s) until the end of the war and performed well. Actually the last sortie by a Finnish plane in WW2 was flown in a Do-17 flying a recon mission at the end of the Lappland War in 1945. Developed from the 9th prototype. Spoted a shortened glazed nose and carried 500 kg of bombs. Photographic reconnaissance aircraft with two cameras and increased fuel capacity. The Do 17K was developed for use by Yugoslavia and was similar to the Do 17M but powered by two 980 hp Gnome-Rhône 14N 01/02 engines. This type was licensed and built by Drzavna Fabrika Aviona at Kraljevo. The Do 17Kb-1 was a bomber and the Do 17Ka-2/Ka-3 were reconnaissance aircraft with secondary capabilities as a bomber or attack aircraft. Two prototypes of a proposed pathfinder version powered by two 900 hp Bramo 323A-1 engines. The 13th and 14th prototypes powered by Bramo 322A-1 engines. This version was used to develop the airframe/engine combination for use on the production Do 17M-1, which could carry a 1000 kg bombload and was armed with three 7.92 mm MG 15 machine guns, in the dorsal and ventral positions and one firing through the starboard windscreen. Two engine test beds, one with two 950 hp Daimler-Benz DB 600G and the other with 1000 hp Daimler-Benz DB 601A. A photo reconnaissance version of the Do 17M, which was powered by two 875 hp BMW 132N engines and fitted with Rb 20/30 and Rb 50/30, or Rb 20/8 and Rb 50/8 cameras in the Do 17P-1 series. Three DB 600G powered high speed reconnaissance aircraft for trials with a prone gunners position in the underside of the forward fuselage, housing an aft firing MG 15 machine gun. The nose was extensively glazed. 15 aircraft were built to this standard as pathfinders, carrying two radio operators among the five man crew. The Do 17Z was the most numerous version built with some 1700 of them being built between 1939 and 1940. Several variants were built. The Do 17Z-0 was similar to the Do 17S with two 900 hp Bramo 323A-1 engines and armed with three MG 15 machine guns. The Do 17Z-1 had an additional nose mounted MG 15 machine gun but was underpowered and only able to carry a 500 kg bombload. In the Do 17Z-2, the Bramo 323A-1 engines were changed out in favour of the 1000 hp Bramo 323P engines which restored the bomload up to 1000 kg, and carried up to eight MG 15 machine guns. 22 Do 17Z-3 aircraft were produced for photo reconnaissance duties, with Rb 50/30 or Rb 20/30 cameras. The Do 17Z-4 was a dual control conversion trainer. The Do 17Z-5 was essentially a Do 17Z-2 with flotation bags in the fuselage and the rear of the engine bays. A single aircraft produced as a long range intruder and night fighter. Incorporated a Junkers Ju 88C-2 nose carrying a 20 mm MG FF cannon and three MG 17 machine guns. Nine aircraft with a new nose housing four 7.92 mm MG 17 machine guns and four 20 mm MG FF cannon. For night fighter duties they were equipped with Lichtenstein C1 rand and Spanner-II-Anlage infra-red detection apparatus. The Do 215 was developed as an export version of the Do 17Z. The Do 215A-1 was equipped with two 1075 hp Daimler-Benz DB 601A engines and originally built for export to sweden in 1939. 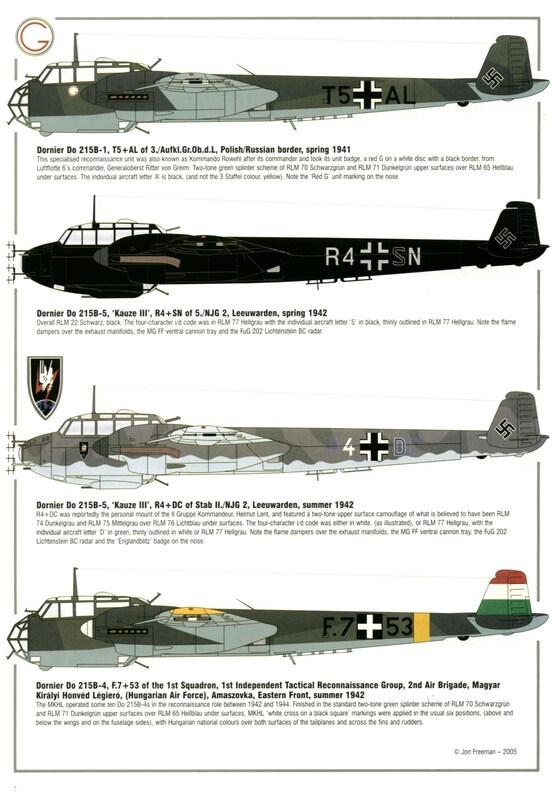 The 18 aircraft built were embargoed and instead put into service with the Luftwaffe as the Do 215B-1 and Do 215B-2. Two aircraft were sent to the Soviet Union as Do 215B-3s. The Do 215B-4 was a photo reconnaissance aircraft with Rb 20/30 and Rb 50/30 cameras. The Do 215B-5 had a new nose similar to the Do 17Z-10 as well as similar armament for the role of night fighter. Aufklärungsgruppen: 2. (F)/11, 3. (F)/22, 1. (H)/32, 1. (F), 2. (F), 3. (F) and 4. (F)/Nacht, F.Kette Lappland, Aufkl. Staffel Kroatien, Flugber. 2. Fl.Div., Erg. FAGr, Erg. Nacht-Staffel. Finnland (Do 17Z): three Z-1 (DN-51, DN-57 and DN-59), three Z-2 (DN-56, DN-61 and DN-65) and nine Z-4 (DN-52, DN-53, DN-54, DN-55, DN-58, DN-60, DN-62, DN-63 and DN-64). Bulgaria (Do 17P) and Hungary (Do 215B). Defensive armament: 2xMG 15 7.92 mm fixed in the nose, 2xMG 15 in lateral windows, 2xMG 15 in upper rear of cockpit canopy and 2xMG 15 in lower rear cockpit fuselage. Bomb load: 1000 kg max., either 20×50 kg or 4×250 kg. Defensive armament: 2xMG 15 in lateral windows, 2xMG 15 in upper rear of cockpit canopy and 2xMG 15 in lower rear cockpit fuselage. This entry was posted in Aircraft, Germany by MSW. Bookmark the permalink.